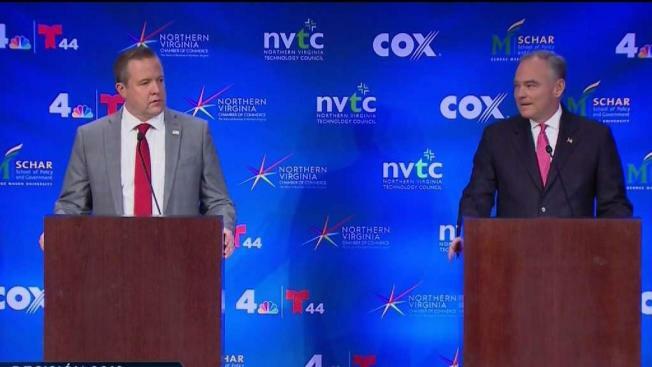 Sen. Tim Kaine outraised his Republican opponent Corey Stewart in campaign funds. Virginia Democrats in key congressional races outraised their Republican opponents, in some cases by large margins, last quarter, according to new campaign finance reports. Reports filed late Monday show Sen. Tim Kaine maintaining a sizable cash advantage over Republican Corey Stewart in the only statewide race. Kaine reported taking in $2.4 million from July to September, compared to Stewart's $1 million haul. Kaine has raised about $20 million for his re-election bid overall, a tenfold advantage over Stewart's $2 million. Kaine, a former governor and former presidential contender Hillary Clinton's running mate in 2016, is widely expected to win a second term to the Senate. Stewart, an outspoken supporter of President Donald Trump, has often battled members of his own party and struggled to raise serious money for a Senate run. Virginia used to be a key swing state, but has grown increasingly friendly to Democrats. Republicans haven't won a statewide race since 2009. But in the House, Republicans control seven of the state's 11 U.S. House seats. Democrats are hoping the same voter antipathy toward Trump that helped them make major gains in the state House last year will carry over to this year's congressional elections, including in districts Trump won in 2016. The party is especially focused on flipping four congressional districts currently held by Republicans, seats that could be key to Democrats taking control of the U.S. House. The newly filed campaign finance reports show Democratic candidates outraised their opponents in all four of those districts last quarter, a sign of potential Democratic momentum ahead of Election Day. Richmond-area candidate Abigail Spanberger raised $3.6 million, the most of any congressional candidate in the state. The former CIA officer's haul was more than triple the amount raised by incumbent GOP Rep. Dave Brat, who brought in $1 million. In Northern Virginia, Democrat Jennifer Wexton more than doubled Republican Rep. Barbara Comstock's third-quarter haul. Wexton raised $2.6 million to Comstock's $1.3 million in a race that's being closely watched nationally as one of Democrats' best opportunities to gain a seat. The district voted for Clinton in 2016 and is home to upscale, educated independents and moderate Republicans who remain wary of the president. Democrat Elaine Luria raised $1.9 million to Republican Rep. Scott Taylor's $676,000 in Hampton Roads. And Leslie Cockburn, a Democrat, raised $1.1 million compared to GOP opponent Denver Riggleman's $695,000 in Virginia's 5th Congressional district, which includes parts of central and southern Virginia. That seat is currently held by retiring GOP Rep. Tom Garrett. All four Democrats also reported having more cash on hand at end of last quarter than their Republican opponents.